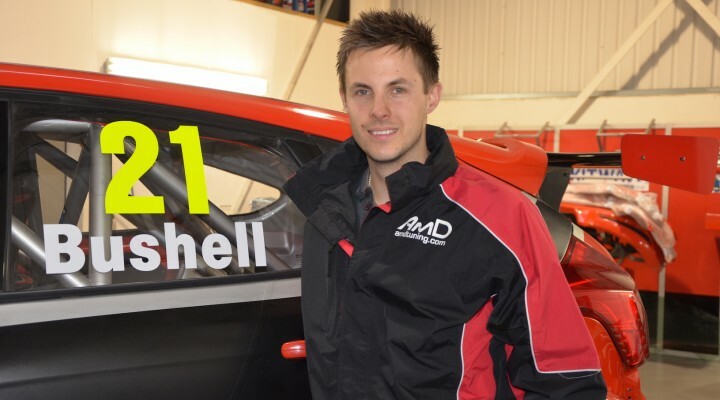 AmDTuning.com can today confirm that it has agreed terms with newly-crowned Renault Clio Cup champion Mike Bushell to spearhead its challenge on the 2015 Dunlop MSA British Touring Car Championship. The 25-year-old from Tunbridge Wells joins the team on the back of an impressive 2014 season, where he secured four wins and four further podiums en-route to the Clio Cup crown. Having made clear his intentions to move into the BTCC as soon as the title was secured, AmDTuning.com moved quickly to agree a deal with Mike, who will be at the wheel of the team’s Ford Focus for his first full season in the series. Although classed as a rookie, Mike has one previous outing in the BTCC to his name at Knockhill in 2013 where, in a one-off outing in a Chevrolet Cruze, he qualified within eight-tenths of a second of pole and only missed out on scoring debut points when he was taken out of race three. He also recently tested with the Motorbase Performance team in its Ford Focus as part of his prize for winning the Clio Cup. Mike’s debut for AmDTuning.com will come at Brands Hatch in early April 2015, with the team keen to try and put a full testing programme in place for the off-season. “Winning the Clio Cup this year was a massive achievement for me, and I can’t believe that I’m now sat here knowing that I’ll be in the BTCC next season,” he said. “I’ve been speaking to Shaun for a while and it’s fantastic to have agreed a deal so early in the off-season. “Early on, my focus will simply be on finishing races and building on the experience I gained when I did my one event in 2013, but I’m confident of quickly getting up to speed. The Ford is a proven package and it felt quite suited to my driving style when I sampled the Motorbase car. The team has a skilled group of people working on it, so there is no reason why I can’t be competitive and push for some strong results as the season goes on. “I’m hoping that Vital Software and TheVinylGuys.co.uk, who were two of my main backers in Clios, will be involved again next year and I just want to thank Shaun and AmDTuning.com for giving me this chance. Team boss Shaun Hollamby said he was delighted to welcome Mike into the team having been impressed with his performances in one of the BTCC’s most competitive support series in recent seasons. “We’re delighted to be able to agree a deal with Mike for 2015, and it is ideal for both parties to have an agreement in place so soon,” he said. “It’s given us time to work on finalising our sponsorship plans for next year, and we are keen to speak to people who want to support a young British driver who we believe can do big things in the BTCC next year.